How well a German Shepherd is groomed has a huge impact on his happiness and if he stays inside, your quality of life! Sergeant's recommended products in this important category are Boshel nail clippers, the FURminator Brushes, Burts Bee's shampoo, Virbac Epi-Otic Advanced Ear Cleaner, and the Booster Bath Elevated Pet Bat, which make giving your German Shepherd a bath a whole new experience! Firminator Brushes are the ultimate in pet grooming accessories. Your German Shepherd will be happier and healthier if it remains well groomed. Frequent trips to the groomer can be both time consuming and expensive. By using FURminator brushes you can get professional results at home. These brushes provide a gentle solution to brushing your German Shepherd. Product Description: Remove dead hair and undercoat with minimal cutting with the Oster 18-Tooth Coarse Dog Rake and Shedding Brush. Designed for medium to large breeds with medium-to-thick undercoats such as Newfoundlands and Shetland sheep dogs, this durable dog undercoat rake creates the look of a hand-stripped finish in minutes. Its solid stainless steel blades offer rounded ends that glide smoothly through fur without irritating skin. 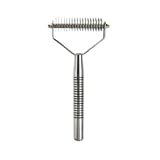 Ideal for shaping, finishing, thinning, and de-shedding, this versatile dog grooming tool resists rust and is easy to clean. Product Description: As creators of the FURminator deShedding Tool, FURminator continues to raise the bar with innovative, proprietary shedding solutions. The FURminator lineup of deShedding tools, grooming tools, hair care products, bathing and hygiene solutions broadens and enhances the FURminator deShedding experience for pet parents and their pets. Simply put, there is no pet care solution on the market like the FURminator product line. The FURminator Large Firm Slicker Brush for Dogs is ideal for medium, long and curly coats to remove surface mats and tangles without damaging the coat. This tool features staright bristles on one size and bent bristles on the other side. Tghe dual flex head design follows the natural contours of your dog's body, while keeping the bristles in their ideal working position. 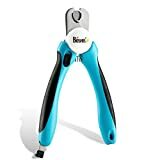 You will love the ergonomic handle for secure and comfortable grip while using the tool. Give your pet the experience of professional grooming, with professional results, right from your home. Look for more professional grooming tools and shampoos in the FURminator product line. De-shed Every Bit Of Your Pet's Coat Effortlessly! 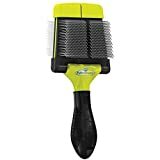 Pet grooming brushes are definitely practical, however, they cannot reach all spots easily, so you will still find hairs on your clothes and furniture. On the contrary, these pet grooming gloves by Petteasey will help you de-shed your small or large dog, cat or horse with ease! Our pet deshedding gloves have textured palms and fingers with soft rubber nubs that will remove all loose hair and leave your pet's fur shiny. 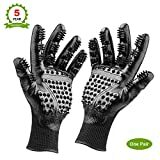 These Pet Hair Gloves Are Not Just For Grooming! In fact, you can also use the flexible pet grooming mitts when you bathe your dog, for optimal results. The pet shedding gloves will also massage your pet, while stimulating a better blood circulation and distributing natural oils for a healthy coat and skin. The Petteasey Dog Grooming Gloves Will Fit You Perfectly! 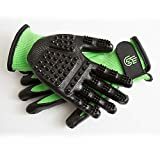 Specially designed to fit the hands of both women and men, these dog deshedding gloves will undoubtedly fit your hands perfectly! Our dog shedding gloves have adjustable wrist fasteners that help you achieve the most secure and comfortable fit. Your hands will feel absolutely comfortable in the cat deshedding cloves, and they won't get sweaty or dirty. For this reason, Petteasey offers you a 100% money back guarantee as well as a replacement warranty with every pair of pet hair brush gloves you purchase. This is a completely risk free purchase, so why wait? Buy the Petteasey pet grooming gloves for yourself or a friend with a pet! 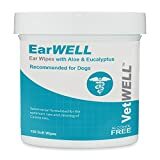 Product Description: VetWELL Aloe Vera Ear Cleaning Wipes for Dogs keep canine ears free from wax and discharge. Fast, easy, and convenient, our hygienic wipes are infused with Aloe Vera and Eucalyptus for a gentle fresh-smelling clean. Perfect for everyday use or as needed. Good Health Begins with VetWELL. Adjustable 3-point restraint system with quick snap removable collar. This is a HUGE patented feature unique only to Booster Bath which competitive products CANNOT incorporate! This included restraint keeps the pet facing forward in the tub and prevents the pet from writhing, jumping out of or backing out of the tub during bathing. Imagine the hazards of a pet trying to leap out of or trying to turn around in a tub almost 3 feet off the ground! 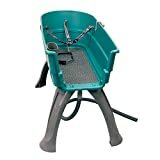 Booster Bath elevates to minimize back discomfort for the bather while keeping your pet secure and safe! Drain hose allows you to easily direct drainage while you stay dry during bathing. Product Description: Otic cleanser ear solution for dogs and cats of any age. Product Description: Burt's Bees has been a pioneer in developing nature-friendly health and beauty care products for over thirty years. We believe that pets are family, so we're bringing the same natural attention and care to your closest furry friends. Burt's Bees Natural Pet Care now brings nature's solutions to our beloved pets with a specially formulated line of natural grooming products including shampoos, conditioner, sprays, wipes, and treatments. Burt's Bees Natural Pet Care products are made using 80% post-consumer recycled bottles. Tap into nature's powers with Burt's Bees Oatmeal Shampoo for Dogs made with Colloidal Oat Flour & Honey to help nourish dogs with dry itchy skin or as to maintain a regular bathing routine. Our gentle formula naturally cleanses your pet’s skin and coat with without any harmful chemicals that make your pet’s coat dry and dull. This formula is made with skin-moisturizing colloidal oat flour, shine-boosting honey, and nourishing green tea extract for a clean that shows! As is typical with natural formulas, this shampoo will only have a light lather and doesn’t have a strong scent outside of the main ingredients as we don’t add in artificial fragrances to any of our products. Burt's Bees Natural Pet Care is made in the USA. Discover nature’s best for your pets! Directions: Shake the bottle up before every use. Apply shampoo liberally to your dog's wet coat. Work from head to tail, while carefully avoiding eyes. Work in and rinse thoroughly. Store in a cool, dry place. Ingredients: Water, Coco Betaine, Coco Glucoside, Glyceryl Oleate, Disodium Cocoyl Glutamate, Glycerin, Xanthan Gum, Camelia sinensis (Green Tea) extract, Colloidal Oatmeal, Honey, Beeswax, Potassium Sorbate, Sodium Benzoate. Safety Warning: For external use only. In case of contact with eyes, flush thoroughly with water. Keep out of reach of children and pets to avoid possible consumption. Will not wash off topical flea & tick treatment when following treatment manufacturer's directions.